The “acidic drinks” being blamed here for rising rates of dental sensitivity following tooth erosion are sports drinks like Gatorade, which some people think of as healthier than soda. In fact, they’re just another kind of soft drink, as are many sugar-laden energy drinks, juice-based drinks and teas. It’s no surprise that we see more tooth erosion these days. The increase has paralleled the monumental rise in soft drink consumption and accelerated after the introduction of energy drinks – which may be even worse for teeth than soda – and popularization of sports drinks among non-athletes. Since the late 70s, “soft drink consumption in the United States has doubled for females and tripled for males. The highest consumption is in the males between the ages of 12 – 29; they average 1/2 gallon a day or 160 gallons a year.” Here in California (PDF), nearly half of all children aged 2 to 11 drink at least one soft drink a day, as do more than 60% of teens and 24% of adults. 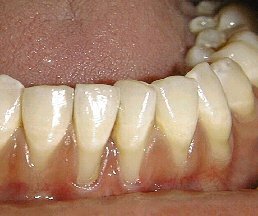 Eroded teeth are necessarily sensitive teeth. The dentin – the layer of tissue between the tough enamel and the delicate pulp – is no longer protected. Cold air or liquid touching it may send shockwaves of pain through the tooth and into the jaw, or hot liquids or foods may cause discomfort. Another factor – often overlooked – is the effect of pharmaceutical drugs. (The skyrocketing rate of prescription drug use likewise parallels the rise in soft drink consumption.) As I mentioned before, dry mouth is a common “side effect” of drugs as varied as antidepressants, anti-anxiety medications, antihistamines and muscle relaxants. Dry mouth may not sound like anything too serious, but it’s got some significant dental implications, raising the risk of caries (cavities), tooth erosion and periodontal disease. This is because one of the functions of saliva is to wash away the microbes that make up dental biofilm (plaque) and food particles that feed them. Saliva is also a source of the calcium and phosophate particles that help keep tooth enamel strong. 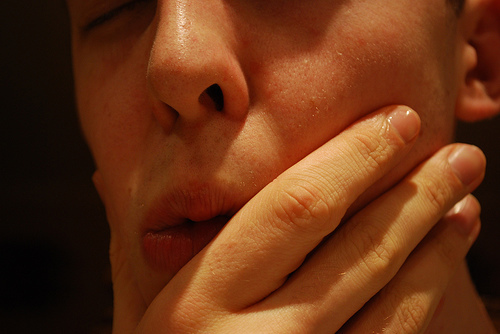 The less saliva, the more conditions favor decay and other tooth damage. If dry mouth is an issue, there are remedies so you don’t put your teeth and gums at risk. In my office, for instance, we have products that can help, such as GC Dry Mouth Gel and the Dental Herb Company’s Tooth and Gums Tonic. But even just drinking more water can help relieve dry mouth, as can eating more foods that require chewing, especially foods like crunchy vegetables. And, of course, moderating or eliminating soft drinks from your diet will also lower the risk of tooth erosion and sensitivity. And if the damage is already done? Above all, see your dentist, so he or she can assess the situation, offer solutions and help you decide on the best course of action for fixing your teeth. In the interim, avoid stimuli that aggravate the pain and, when cleaning your teeth, use a very soft toothbrush and toothpaste formulated for sensitive teeth. Dental Care Great, Dental Health Worse? An article in the Vancouver Sun this week suggested that Baby Boomers have “unique” dental problems. Although, as a group, Canadian Boomers “are keeping their teeth clean and healthy, they are also experiencing an increase in such problems as exposed gums, dry mouth, acute sensitivity and tooth root cavities.” We see similar trends in the US. Dr. Steven Weiner, an Ontario dentist featured in the article, generally attributes the phenomenon to better care early in life, more saved teeth and longer lifespans. “In previous eras, if you had a toothache, you pulled the tooth. Then you had to deal with other issues that involved. People now are retaining their teeth longer – for a lifetime – and that wasn’t the goal back then. How is it that a person can have “great home and dental care” yet have “poor gums” and other dental problems? And is this really unique to Baby Boomers? Or is it more that theirs is just the first generation to have these problems in large numbers? My hunch is that there’s more truth in the latter. The article mentions – almost in passing – some trends that I would argue are now having a big impact on people’s dental health. One of them is the increased use of pharmaceutical drugs, many of which cause dry mouth as a so-called “side effect” – drugs as varied as antidepressants, anti-anxiety medications, antihistamines and muscle relaxants. Dry mouth may not sound like anything too serious, but it’s got some significant dental implications, raising the risk of caries (cavities), tooth erosion and periodontal disease. This is because one of the functions of saliva is to wash away the microbes that make up dental biofilm (plaque) and food particles that feed them. Saliva is also a source of the calcium and phosophate particles that help keep tooth enamel strong. The less saliva, the more conditions favor decay and other tooth damage. There are a number of safe and helpful products available to help increase saliva flow and alleviate dry mouth – products such as GC Dry Mouth Gel and the Dental Herb Company’s Tooth and Gums Tonic. Drinking more water can help, as can eating more foods that require chewing, especially foods like crunchy vegetables. This brings us to another major trend I see affecting people’s dental health: diet. Since the Boomers came of age, highly processed convenience foods and sugary soft drinks have become much more common – more available and consumed in larger amounts. High fructose corn syrup has become ubiquitous in processed foods, increasing our overall consumption of added sugars. Our intake of refined carbohydrates has skyrocketed, and few of us eat nearly enough whole grains, fresh vegetables and fruit. The result is a diet that is highly acidic, promoting tooth decay and inflammation. (Gum disease, like heart disease, is a chronic, inflammatory condition.) Moreover, the acids and sugars in sodas, energy drinks and similar beverages further contribute to tooth erosion, as a great many studies have shown. If we, as a society, continue in these directions, we can expect the “unique dental problems” mentioned by Dr. Weiner to be the new norm. But it’s not too late to turn things around. By making positive, healthy life choices, we increase the likelihood of our having both healthy teeth and gums into our senior years. Comments Off on Dental Care Great, Dental Health Worse?